Yes, that probably was a bald eagle you saw in Kansas this summer. Nope, it’s not lost or didn’t miss the migration. This spring and summer a record high 137 active bald eagle nests were located in Kansas. Nests normally have one to three eaglets, plus both parents. To date over 1,000 bald eagles have been hatched in Kansas in modern times. Most people are aware at the perils bald eagles once faced in the lower 48 states. As recently as 50 to 60 years ago it was feared our nation’s symbol might be headed to extinction because of poaching and ingested pesticides that made it almost impossible for the birds to reproduce. The big comeback started in the 1970s when the birds got further protection, and the outlawed chemical became a thing of the past. In 1989 a pair of bald eagles successfully nested at Clinton Reservoir. 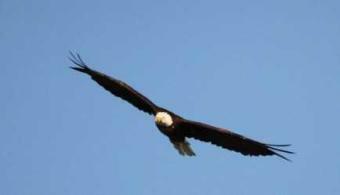 It was certainly the first known nesting bald eagles in Kansas in at least 100 years. Since, nesting pairs have spread across the state. Many of those nests have been made by birds originally hatched in Kansas. Most major reservoirs and major rivers have several nesting pairs. Bald eagles have come back so well across America they’re no longer on the endangered or threatened species lists. Most years only about one in five eaglets survive their first year. After that, life-spans can be long. The male of the pair that first nested in Kansas in 1989 was still active at least through 2015. The male eaglets that hatched in that first nest were still helping raise young in eastern Kansas through the same time.